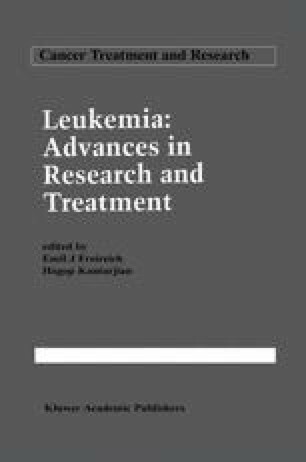 There is now compelling evidence that the blast cells of acute myeloblastic leukemia (AML) often respond to regulatory mechanisms both in culture and in patients. Growth factors are either required for blast cell proliferation in culture or substantially influence its rate [1–11]; clinical trials have shown that growth factors are also active in patients [12–27]. Retinoic acid, a ligand for three intracellular receptors of the steroid superfamily [28–34], inhibits the growth of some AML blast populations in cell culture, an effect often accompanied by morphological evidence of differentiation [35–38]. The most striking effects are seen when all trans retinoic acid is added to cells from patients with acute promyelocytic leukemia (APL) with translocation of the α-retinoic acid receptor (tl5: 17) . In vivo, remissions are obtained with all trans retinoic acid alone [42,43,44]. Taken together, these observations support the view that AML may be considered a dependent neoplasm and that its responsiveness to regulation may be exploited in treatment.